It is mentioned in the Bricks thread, but I thought I would start a fresh one related to the programme and could not find anything else on the forum (please correct me if I'm wrong). All I could find was the press page on the Channel 4 website here . "Last year LEGO became the most profitable toy maker in the world. Now this notoriously secretive, privately-owned superbrand has opened its doors. We discover what makes it tick, meet some of its key people and reveal more about the company DNA than ever before. 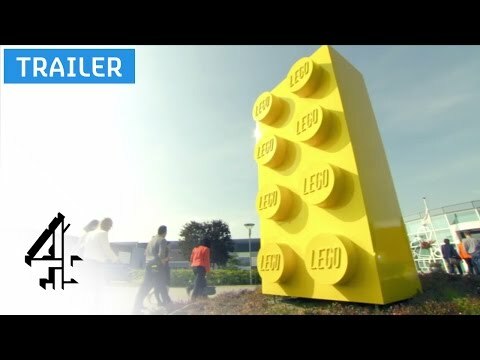 In The Secret World of Lego, we follow Justin, a 23 year old design student, as he travels to LEGO headquarters in Denmark in pursuit of one of the most hotly contested jobs in the world – a LEGO set designer. We meet Liverpudlian Matthew, who undertook the same process and has now risen to become a Vice President of Design. We follow Mark and Tom, two adult fans of LEGO, as they try two different money-making schemes they hope will transform their love of the brick into hard cash. And there’s Roar, the LEGO “reputation manager”, who guides us through this secret world - until we get a little too close for comfort." Sounds quite interesting and I will certainly be watching. I just hope that it is a genuine look at the company and not be twisted by the channel's interest in making a story, which is always a danger with these things. The words used are quite unusual IMO (notoriously secretive?) and make it sound like the inside world of a Bond villian when in fact any great company could be described that way, especially if you are going to stay ahead of the game. Anyway, I'm hoping it will be a great insight for those of us unable to make the Inside Tour every year, or like my 8 year old, show him how difficult it is to become a LEGO designer! According to the Channel 4 website it is on 14th June at 8pm. One to drag yourself away for a moment, from building the Ferris Wheel or riding an ostrich in LEGO worlds! I assume Mark is Mark Guest, looking to make from publishing. The other one I'll guess is a bricklink seller. Yes, this is the one that's been mentioned in passing that followed Mark around while he launched the new magazines. There's a chance I'll be in it as they came to Billund with us back in March. Hopefully not too much, though! I'm going to be away when it's on so will have to set the Sky+. This sounds good. Going to sky+ it to make sure its watched. That's the only thing I worry about as well, no matter how careful you are, the final cut can sometimes end up as not what you were expecting, but we will see... I hope it will be an insight to the company we all love. Yes, this is the one that's been mentioned in passing that followed Mark around while he launched the new magazines. Thanks Huw for confirming it, just make sure you set the Sky+ correctly! The fact that its on channel 4 makes me wonder if they'll go for an angle, rather than a friendly in sight into the company. That said, they programme description may just be making it sound more contraversial than it actually is, just to get people like us to watch it... Looking forward to the closing scenes of the documentary as the camera crew flee Billund for uncovering a deadly secret, chased by an army of mindstorm operated killer robots. While carrying bags of swag. 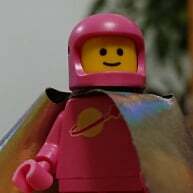 The producer/cameraman who followed us to Billund seemed like a good guy and gave the impression that they would not be looking to sensationalise it, or make those taking part look like idiots. Only a week to go, why don't we leave it and see what happens? Despite my reservations, I'm still looking forward to it, so let's speculate on what we hope to see rather than what we don't! We can jump to LEGO's defence next Sunday evening if Channel 4 doesn't do a good job! Ah that's fair enough. As I said I wasn't necessarily expecting the worst, it's just that whole thing of never really knowing with tv. Thomas Poulsom just announced he will be featured on the show. I cannot wait for the show, how long will it be? According to the Radio Times TV listings, it's one hour long, 8-9pm, 14th June. Hm, I'll keep an eye out for this. "This intriguing doc attempts to discover how a family-run business based in a Danish village became the biggest toy manufacturer in the world. The case is built brick by brick, talking to workers at Lego HQ, adult fans and a student applying for a job as a designer. It promises to lift the lid on the secretive company, but everything feels stage-managed – a design team admits to re-creating a conversation for the cameras. Finally, after hearing fans' and workers' evangelical zeal, the question has to be asked: is Lego a cult? When the CEO talks about the company's values in terms of spirituality, the answer seems to be yes." Totally different to the view on the Channel 4 website! Thanks for the ends up, sky+ed already, will keep an eye out for huw. For those that miss the programme or don't set their Sky+ correctly, it will be repeated on 4seven on Monday 15th June, 9:00pm and again on 4seven on Wednesday 17th June, 2:30am. Also, if you miss the main programme, it's repeated on Channel 4+1 the next hour on Sunday (9-10pm). No excuse now for anyone to miss it! It may be available for download on 4od in the days afterwards as well, but can't find that confirmed anywhere yet. Just noticed that the programme is appearing as listed on "All 4", so it looks like you will be able to download later and watch at your leisure for those of you without Sky+ etc. just seen the advert excited much! Just seen the advert again on TV, so thought I would bump this to the top in case anyone hadn't seen it, although I think the entire world knows, but you never know! Can't wait to see this program! For those of us outside the UK, it will be wonderful to see the link for downloading the show. Folks seem to be tiptoeing lightly around the question: '"Is LEGO a cult?" I would argue that it sure as hell is, and who cares? Everyone needs multiple things to believe in/play with during a long life, and LEGO is just one of those options. Is soccer a cult, yup, too, for many folks. Likewise for cooking, golfing, Nascar/Formula One, drinking, many churches/religions, gardening, watching films/tv, and so on depending on ones level of devotion to that activity. IMHO all cults are not bad and do not pass out fatal Kool-Aid to drink. I have just had a look on the Channel 4 website at their FAQs here and it appears that you can't watch their programmes abroad, although given the world-wide interest in Lego, I would hope it can be viewed for you all later. @AndyPol ; Does that mean that outside the UK we can't download the show? Thanks! I don't think there are any legitimate ways to do it, sorry :( If there are, someone on the forum might know and I would happily be corrected? @legogal I have used https://www.filmon.com/group/uk-live-tv on my tablet abroad before. Just tried it again and the site still works. I'd argue that it isn't. Cults generally have some form of rules or structure that is maintained to a perceivable level. 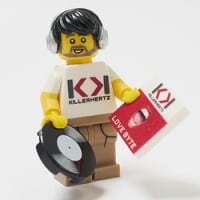 The first thing that a new person notices about the LEGO community is just how little rules or structure we have* - everyone thinks differently, builds differently, and, occasionally, will defend their way of building or thinking to the death. So, I could suppose you could argue that "every LEGO builder is a one-person cult," but I don't think you would. *And LEGO's cult thinking isn't that "there are no rules" - if it was, there'd be a whole lot more Cloud Cuckoo Lands. @legogal I use the same as @bendybadger and it should be legal as it was pre-installed on my laptop when I bought it. Thanks for the info! Looking forward to the show. Well written. I can see where you are coming from and recognize both points of view. Yup. LEGO followers tend not to be as fanatic and rule bound as many stricter cults. I prefer the positive approach to cults...they can give people a great sense of belonging to a group of folks like themselves who enjoy doing something similar large parts to the time. We are true believers in the power of LEGO to give us many years of pleasure. And yes, while there are lots of little rules (don't use the word "Legos," don't glue anything, don't use clone brands or talk about them here, postings have to be appropriate for families, stay on topic,) ... But these rules are nothing like those of the Major, SERIOUS DUDE cults that we read about in the press so often. How many people are now rushing out to buy a music stand? I loved it when the lego designers saw the cameras outside and closed the metal shutters!!! If you were there on the day, it was worth it for the signing. Quite enjoying this. Much better perspective on the adult collector than other shows have seen too. 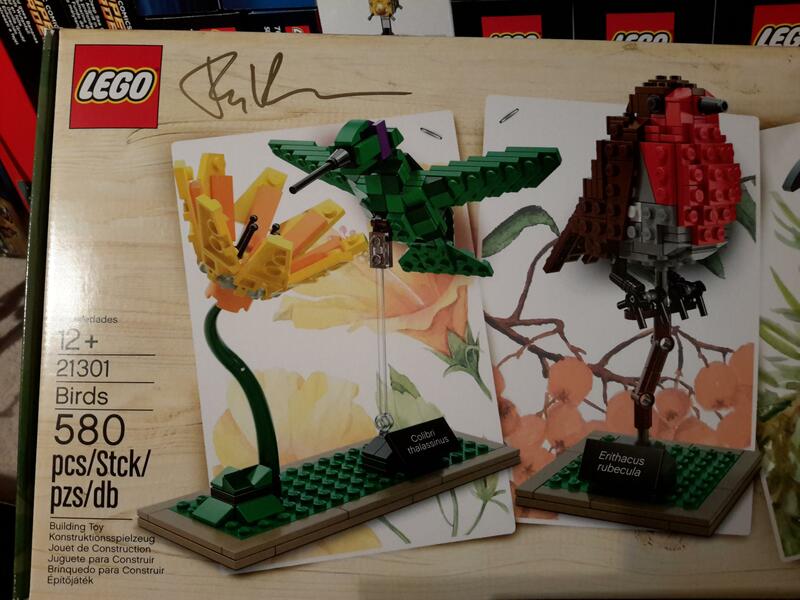 Think I might have to buy the Birds asap before the publicity leads them to sell out! I wonder what the Birds royalties were?! 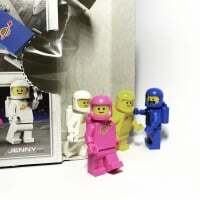 Loads of familiar faces at the Bricks Culture launch - Pete Reid,, CapnRex, Nick @Minifigsme, to name but a few. Love seeing all my friends on the show! Sad you were missed out Lucy! Can't believe Huw didn't get any intro! He said enough to buy a car but not a Porsche so approx £20k? ? That's 1% net profit in 3 months, so 100% = £2m or £8m in a year. Blimey. I need to submit some Ideas! ! For something that couldn't possibly cover everything in just an hour, I thought it was fantastic, and a great insight.